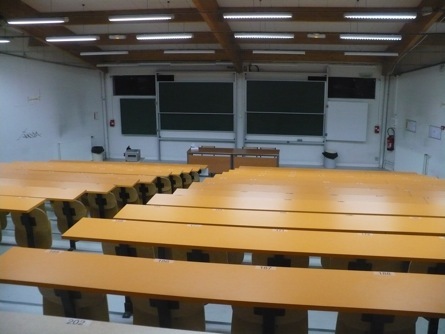 Early this monday morning, I happened to be in a lecture hall at Paris-12, down in Créteil about as far as you can possibly get from my apartment and still be on the paris métro. I arrived in the room about 8:03am, an hour before anything was happening there. It was dark and empty. Amphi Orange, it was called, Amphi being short for amphithéâtre, Orange possibly being related to the desks’ hue, which reminded me of some sort of artificial american cheese product. This post is going to be boring for people who believe that social life can only happen in a crowd. This is a post about the signs of past social action inscribed in architecture and writing. To see your way around you had to turn on the lights. 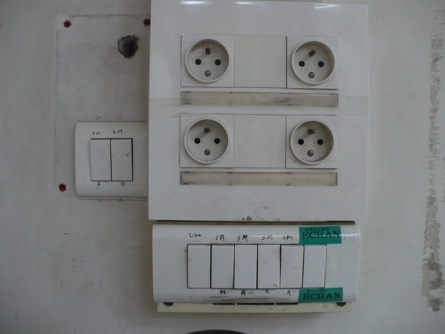 This switchpanel did the trick. Stop for a second to notice its anti-aesthetic aesthetics, its calculated practicality, the way that its intentionally secondary, instrumental functions are mirrored by the camouflaged design of its switches. Note, too, that the designer has blundered by not making provisions for labels: the users have been obliged to write on labels with black marker. 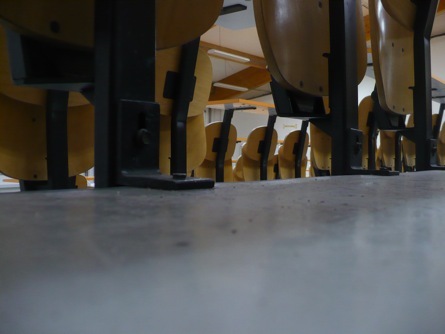 If we climb up to the back of the room, our gaze falls into the standardized pattern of lecture hall vision, angled down, aimed at the blackboards, aimed at the podiums, aimed down at a desk where, if we were students we could be taking notes. It’s empty. A few people wandered into the room while I was there only to glance at me and wander out. It’s not only events that are scheduled on university calendars; it’s also emptiness and empty space. If for some inexplicable reason we peer under the desks, the long landscape of the amphitheatre is disrupted by the iron trunks of chairs and the round wooden wings of seats and hanging desks. No more clean linearity of the sightlines. Not everything was what it appeared to be. 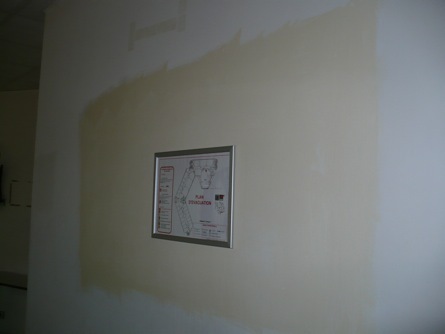 This discolored patch on the back wall, now decorated with a fire evacuation plan, was almost certainly once a window into an AV booth. I couldn’t say why it was walled off. 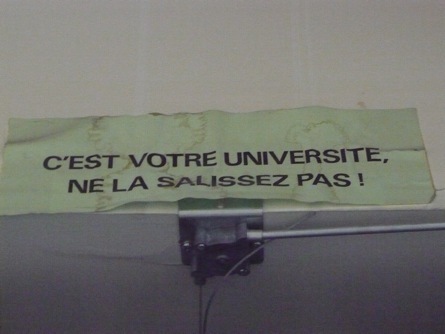 “It’s your university, don’t dirty it.” I saw a couple of these signs. Apparently someone believes that little moral exhortations on signs are going to radically improve the course of student conduct and reduce (what must look to administrators like) vandalism. Ironically, the sign itself is dirty, crumpled and worn. “We want a rich life, not the life of the rich!! 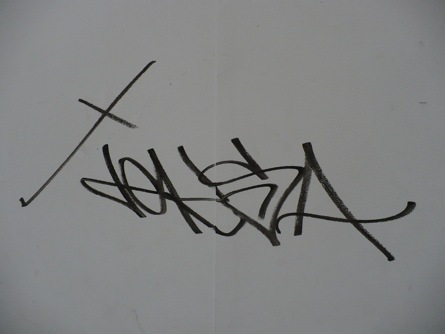 !” It turns out that some of the seeming student “graffiti” was also a carrier of a moral message. But a radically other moral message from the “don’t get things dirty” imperative of the other sign. 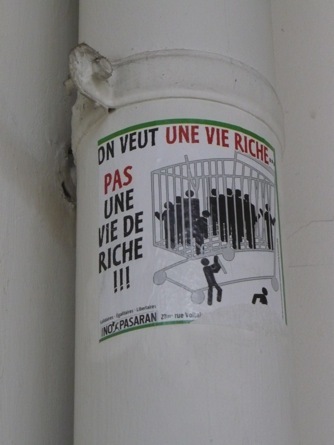 This is an anti-wealth or anti-class message, I guess. A curious image of human beings in the cage of a shopping cart. I hadn’t heard of this group, No Pasaran! they seem to be called, but they seem like some kind of small left-libertarian group. From their website, I couldn’t tell what they do besides publish a journal. That and put up stickers. 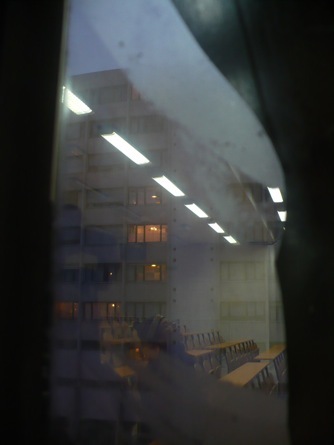 They made an attempt to paint the windows black, but if you found the gap in the paint there was a view out into the bitter gray of near-dawn, the lit windows of the next building fading into the reflections of the desks in the glass.